BARITONE UKULELE. LIGHT GAUGE. D.G.B.E. GROUND NYLON. 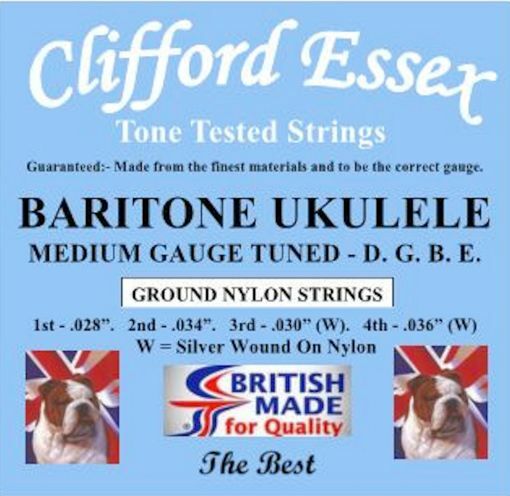 HIGH QUALITY STRINGS. Postage to UK Destinations : FREE Rest of World : £5.00. BARITONE UKULELE. MEDIUM GAUGE. D.G.B.E. GROUND NYLON. HIGH QUALITY STRINGS. BARITONE UKULELE. TUNED G.C.E.A. HIGH G.
BARITONE UKULELE. HEAVY GAUGE. D.G.B.E. GROUND NYLON. HIGH QUALITY STRINGS. BARITONE UKULELE. TUNED G.C.E.A. LOW G.